If you played strategy games towards the tail end of the 90s/early 2000s you may recall Sudden Strike and its sequel SS2—tactical RTS affairs set in World War 2 times that enjoyed a distinct, although somewhat cult, following. A third and fourth game followed in 2007 (2008 in the US) and 2010 respectively, however the introduction of a 3D graphics engine and overhauled UI divorced them from their forerunners in both style and aesthetics. Now, publisher Kalypso Media and developer Kite Games have revealed Sudden Strike 4 is on its way, aiming to touch down at some point in Q2—April 1-June 30—2017. 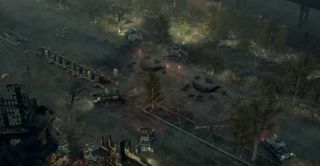 “Developed as a full-fledged series entry and not a remake or reboot, Sudden Strike 4 sends you off on three extensive campaigns set amongst the battlefields of World War II,” reads a statement. “Commanding the British and American, German or Soviet troops, you will lead over 100 different units into battle, including the German bomber Heinkel He111, the Russian T-34 tank, the British Hawker Typhoon fighter plane and the notorious German Panzerkampfwagen VI Tiger. You’ll do all of that across three campaigns “with over 20 missions” in either single-player or competitive multiplayer mode. Our console cousins are getting the latest series entry when it arrives next year, but modding support remains exclusive to PC via the Steam Workshop.